I grew up in a very health conscious household and I always preferred healthy food over junk food or packaged snacks. It’s no wonder why I never tasted Nutella during my childhood. I bought a Nutella jar the other day, but I wasn’t going to eat the whole jar all by myself! So I decided to bake these cookies. 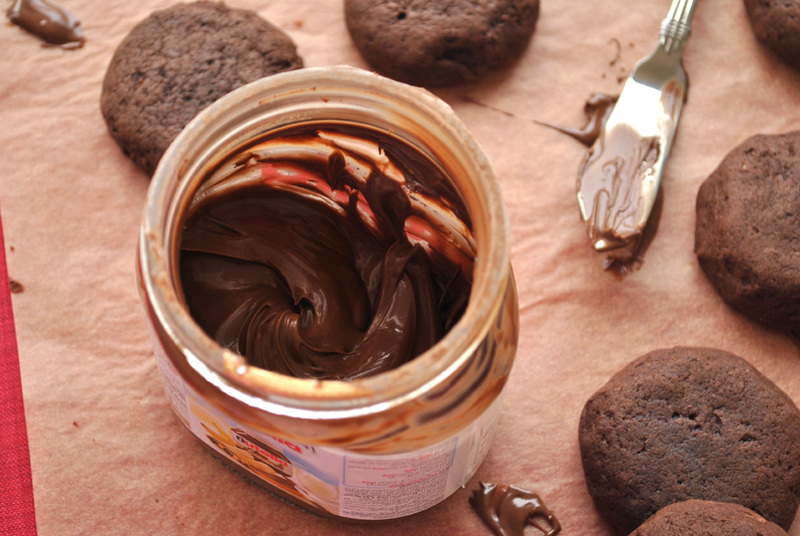 First I looked up the history of this yummy chocolate spread (typical me). It was first manufactured in 1946 by Pietro Ferrero in Italy, under the name “Pasta Gianduja”, but it wasn’t until 1963 that “Nutella” was introduced to the market. It is so popular today to the point that the number of jars sold annually (if lined up) would wrap around the moon four times! … Impressive huh?! 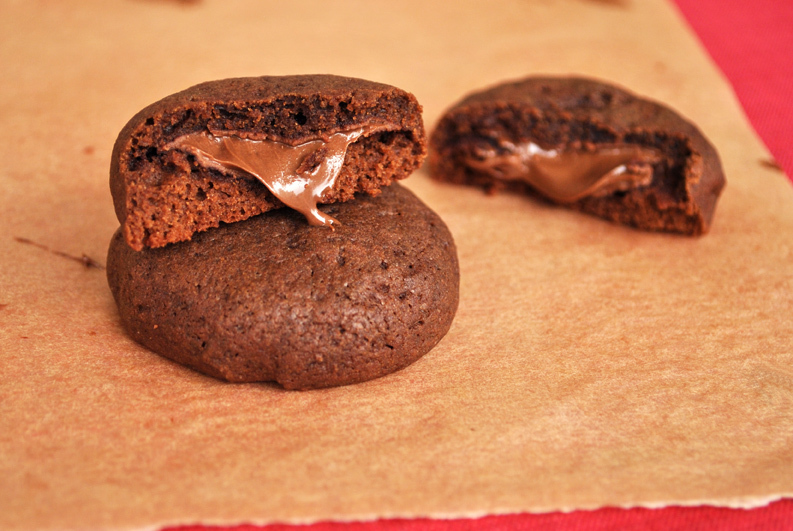 The cookies turned out delicious, especially when they are warm and oozing with pure Nutella filling. It’s the texture that truly won me over: slightly crisp on the outside and soft and chewy on the inside. 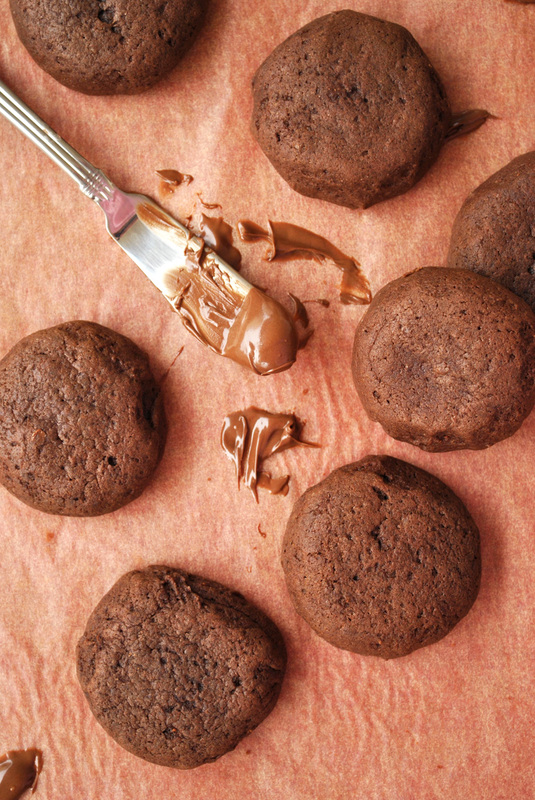 Don’t these look ridiculously irresistible? First, roll out a teaspoon of dough into a ball. 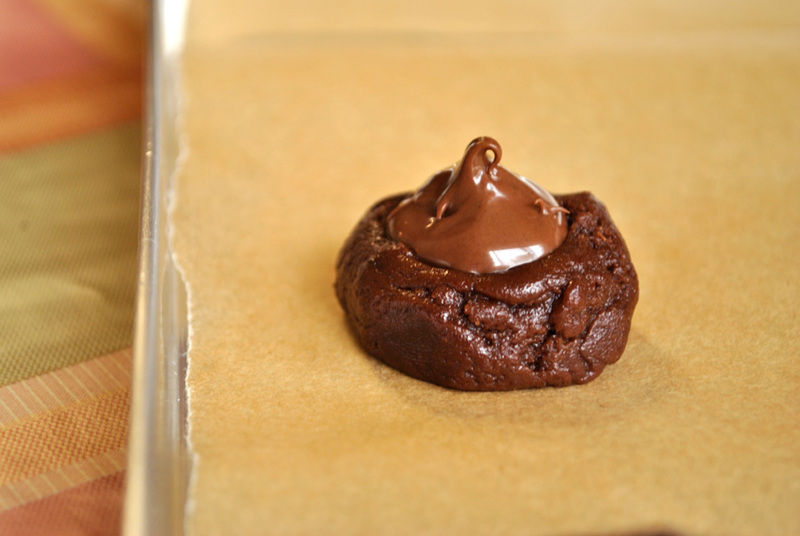 Take another teaspoon of dough and flatten it with the palm of your hands to seal the cookie. Then bake for 10 minutes! These rich cookies should be soft when you take them out of the oven. They will firm up as they cool, so be careful not to over-bake them. Did you try baking these? 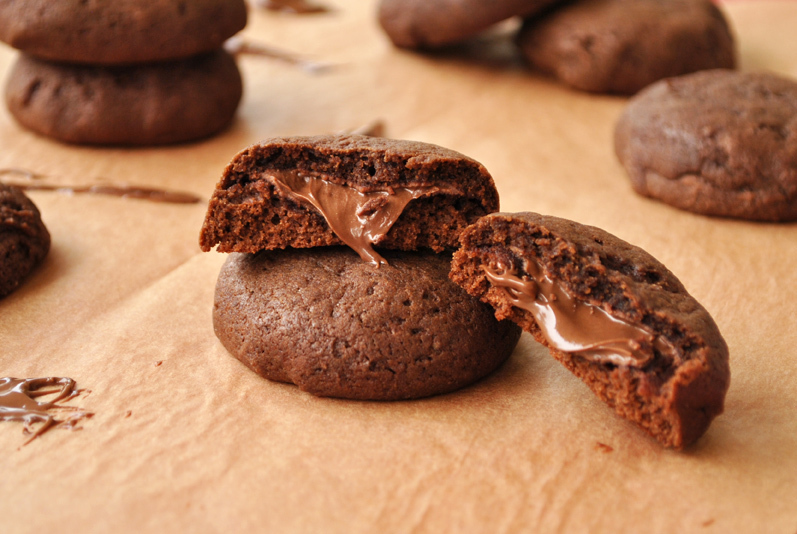 Do you have another favorite recipe for Nutella cookies? I’d love to hear your comments! 2. Melt the butter in a saucepan then take off the heat (you could microwave the butter instead). 3. Stir in the brown sugar, cocoa powder, eggs and salt until well combined. 4. Add the baking soda and flour and stir until just combined. 7. 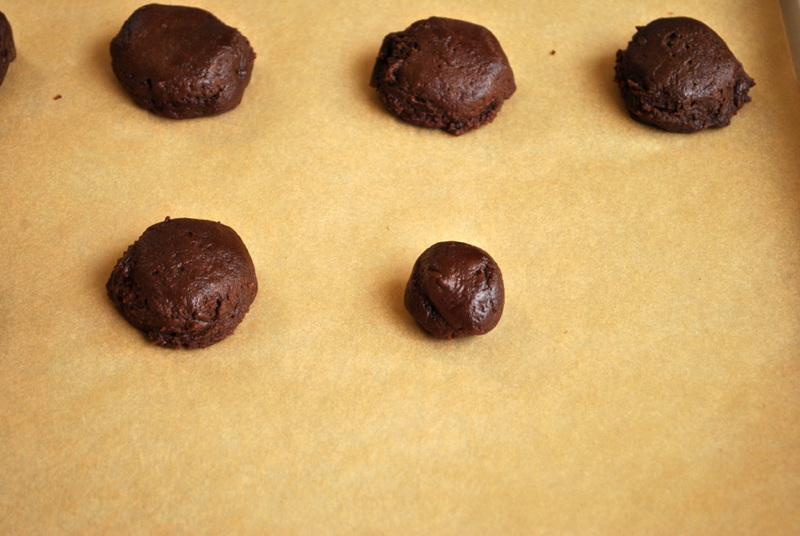 Roll 1 teaspoon of dough into a ball, use your finger make an indentation in the center. 8. Fill the indentation with Nutella (approx. 1/2 tsp), top with a flattened teaspoon of dough, and pinch the edges. 9. Bake for 10 minutes. 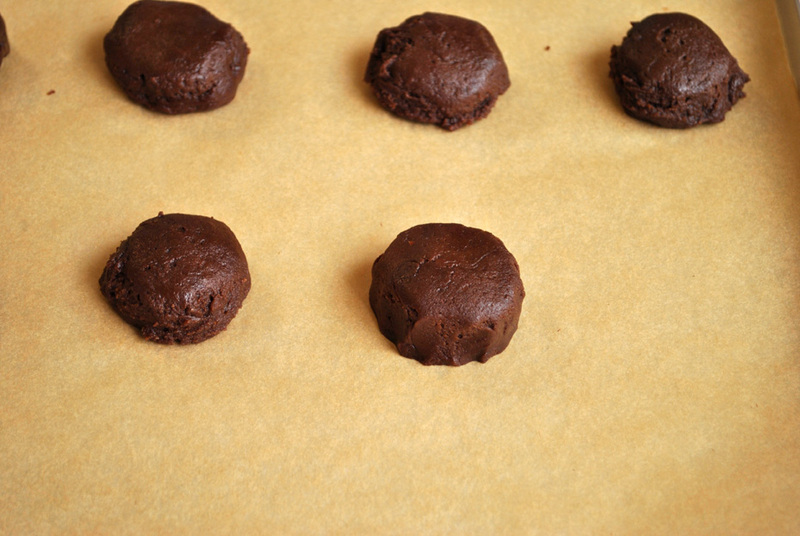 (Do not over-bake, the cookies will firm up as they cool). Let cool for 2 minutes on baking sheets before transferring to a wire rack. Oh nooo, you’re killing me! These look too good! Oh yum, your cookies look amazing! Around 16 to 20 cookies! 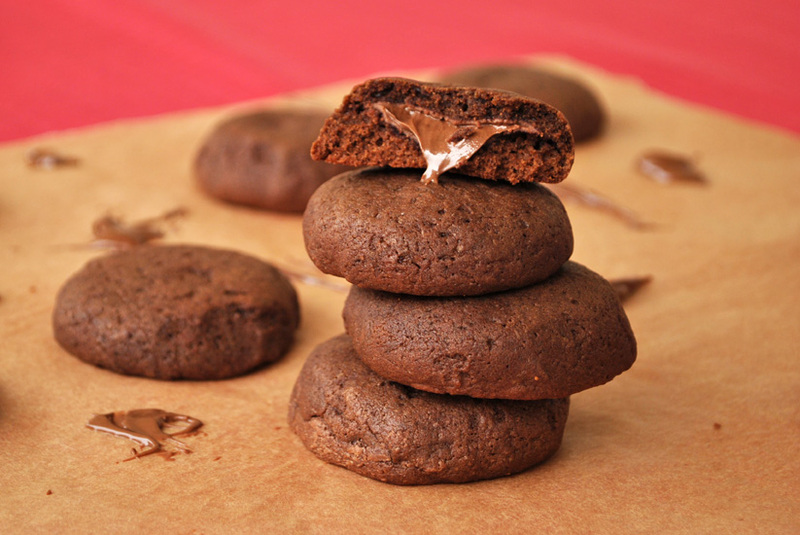 I just tried making these and they are absolutely delicious!!! Thank you for this great recipe! I love these cookies. Thanks for the recipe. Hey Chloe! 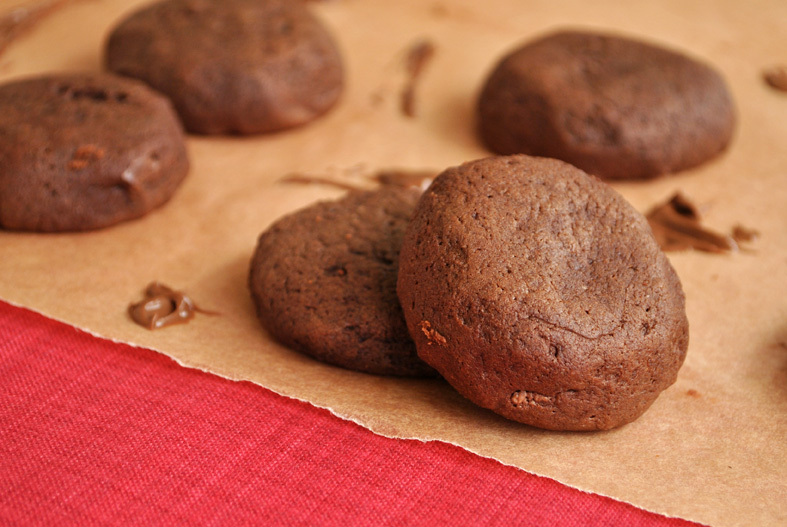 I never tried freezing these cookies, but I’m sure that they freeze just as well as any other cookie recipe! Hi trying these now, my 3 girls are waiting impatiently in line!! !